Spring 2013 has kicked off to a great start and the photo above is exactly why. Lava rock, although traditionally used, does not have the same quality of look that fire glass does. The several colors, glass mixes and reflected colored glass opens the window to creativity and longevity to your fire pit or fireplace. Homeowners now have the ability to give their fireplace or fire pit complete contrast and design with Glaz Chips Fire Glass. If you question the longevity of both products, lava rock will look weathered and extremely dark over time making it unpleasant just to look at. Glaz Chips has been tempered to withstand the heat of a fireplace and will not cause the color to fade or emit any toxins. A simple rinse or hosing the glass down with water is normally required in an extended period of time. Recommended to be used in natural gas, darker colors can still be used with propane gas and will require additional maintenance. If you’re asking yourself why that is, the chemistry of propane burns dirty and will eventually cause a layer of debris over time. Nonetheless, Glaz Chips Fire Glass offers a completely different look. It’s a look that no one hasn’t seen too often and will definitely catch the attention of your family or guests during the spring or summer time. Whether you have fire glass indoors or outdoors, you’ll be adding a beautiful aesthetic to your existing fireplace. Does the idea of doing something completely new and different tempt you? Visit the website at www.glazchipsfireglass.com and find incredible prices from the assortment of glass crystals or call toll free (877) 371-1418 if you still have questions. Black Fire Glass | Original Price $4.15 /lb | Discounted Price for the month of March $3.05 /lb | Recommended both for natural and propane gas applications. Aqua Blue Fire Glass | Original Price $6.95 /lb | Discounted Overall Price $4.85 /lb | Recommended both for natural and propane gas applications. Bronze Fire Glass | Original Price $5.75 /lb | Discounted Overall Price $3.25 /lb | Recommended both for natural and propane gas applications. 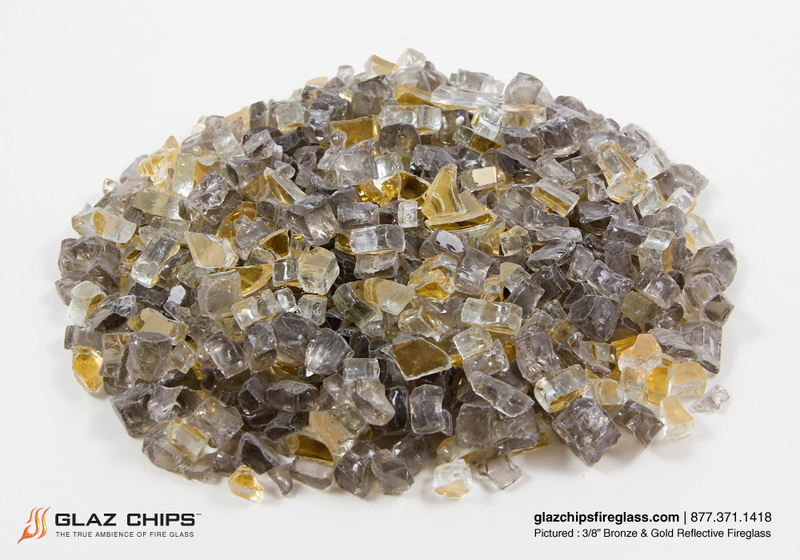 Clear Fire Glass | Original Price 1/4″ $3.25/lb | Discounted Overall Price $2.65 /lb | Recommended only for natural gas. How Much Fire Glass Do I Need for My Fireplace? 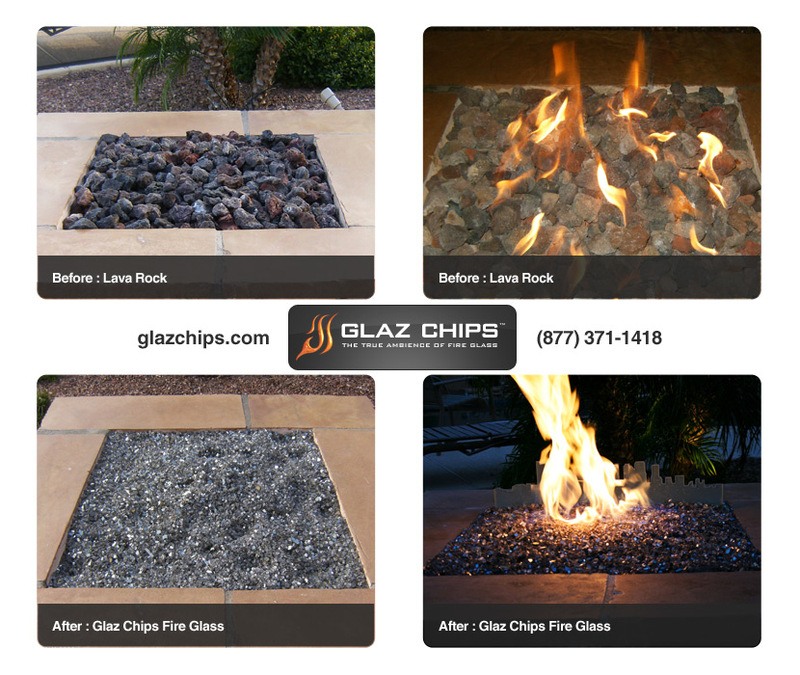 Glaz Chips has created a fire glass calculator for both fire pits and fireplaces. This glass calculator will give you a better idea as to how much you will be needing. If by any chance you think the amount is rather high and would like other alternatives or recommendations on how much to purchase then give us a call at (877) 371-1418, we would love to hear from you and help you out. Categories: decor, Outdoor Fire Pit | Tags: bronze fireglass, fire pit decor, fireglass, fireglass for fire pits, fireglass sale, fireplace decor, fireplace glass stones, lava rock, modern fire pits, reflective glass | Permalink. Take advantage of our December 2012 special on fireglass for fireplaces and fire pits. Whether you want to impress your family and guests this holiday season with something completely different or use as a gift, you can’t go wrong with Glaz Chips Fire Glass. 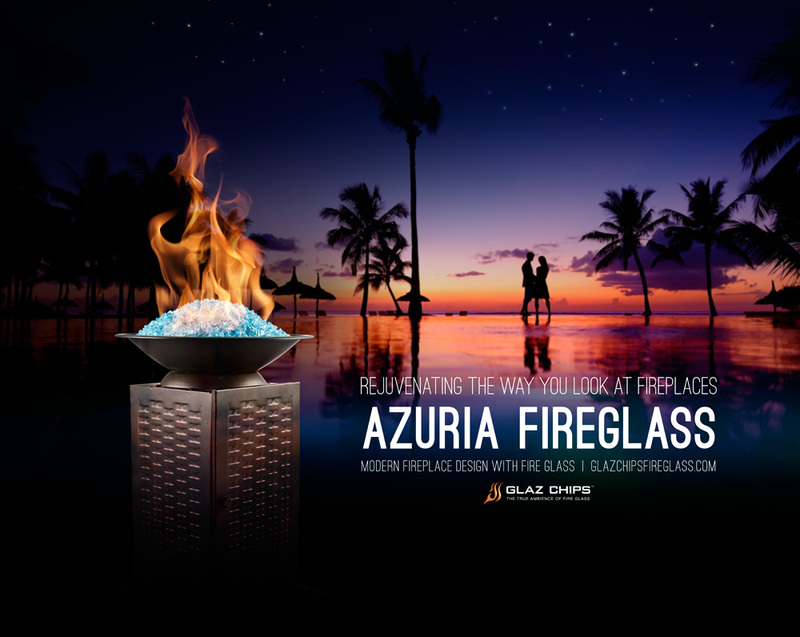 Already one of the lowest priced online products, Glaz Chips Fire Glass is slashing its prices even more. Glaz Chips is putting its top sellers on sale at an amazing and affordable price this December. Sunset Gold Fire Glass, originally priced at $6.95/ lb, is by far the most popular seller this year. With its near like copper color along with a gold reflective coating Sunset Gold will give your fireplace a new dimension and something pleasant to look at during the night or day time. In case you’re thinking of a lighter color, Glaz Chips is also cutting its prices on Silver Premixed Fireglass. Originally at $5.75 /lb, put some money back in your pocket while witnessing a beautiful combination of Azuria Firelgass with Silver or Green Fireglass with Silver. Either way, Glaz Chips likes to give its customers options for you to take control of your creativity for your indoor fireplace or outdoor fire pit. How much fireglass do you need? Take a visit to our online glass calculator on Glaz Chips’ website and punch in your measurements on a standard fireplace, square or round fire pit and find out how much you will need. The holidays are near!!! Give a great impression while your family and guests gather together this holiday season!!! Offer ends 12/31/2012. Have any questions on our fire glass product? Please visit us online at www.glazchipsfireglass.com and drop us a message or call toll free (877) 371-1418. Wait! Use promotional code WP10 at checkout and receive an additional 10% OFF your purchase. Free shipping available for orders over $99 in the continental U.S. Categories: fireplace, holidays | Tags: fire glass rocks, fire pit decor, fireglass, fireglass for fire pits, fireglass for fireplaces, fireplace decor, fireplace design, fireplace glass, fireplace glass stones, glass chips for fireplaces, glass crsytals for fireplaces, glass for fire pits, glass for fireplaces, holiday specials, modern design for fire pits | Permalink.